By all accounts, April wasn't the best month. Although for the most part everything has turned out alright for non-Americans, Black Friday caused a fair amount of worry. Sadly, as a result of BF my hopes of gaining Supernova Elite have fallen by the way side, but there is a cause for optimism in the coming months. Although the games don't fill quite as fast with traffic down 20-25%, they do seem a little softer, and I am quite excited about the SNG changes that PokerStars are bringing in very soon. I pretty much took the second half of April off after Black Friday, and consequently my volume for the month was pretty dire. My results were pretty bad for the first part of April, but put a good run together to at least salvage something from the month. I can expect some insta-run-bad for even mentioning this, but I noticed I passed the $100,000 mark for lifetime SNG/tournament earnings on PokerStars (for the first time, and hopefully the last time else I'll have downswonged my way there next time!). Sharkscope recorded my first game on 16th January 2006, which perhaps makes the milestone a little less impressive as I've had over 5 years to get there. However I really only started playing seriously in June 2009, and having a look back at some of my old blog posts (such as this one starting an experiment on Stars) it's interesting to see how I got started on Stars. I remember seeing this post on Blonde Poker with a player (screenname 'Salfi') talking about how he'd made a lot of money playing 45-mans on Stars. 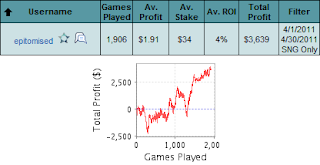 I'm a sucker for sick graphs, and I couldn't believe how sick his graph was for playing only $12 games, and the kind of money that was possible. So I made the transition from playing HUSNGs on Boss Media (as I had been doing since the Tribeca network shut down at the beginning of 2007) over to MTTSNGs on PokerStars, and it was probably the best thing I ever did. 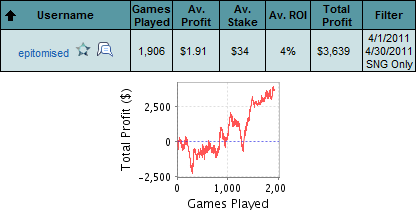 Now I have a sick graph of my own to admire, and hopefully the poker gods won't deem this post as too much of a brag so that they send it crashing down! 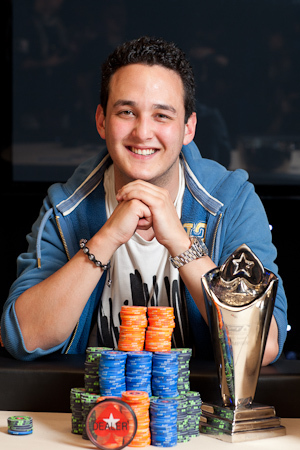 A big congratulations to Rupert Elder for winning the EPT in San Remo today for a whopping €930,000. I've actually only met him in person once, but he's a regular poster on the forum that I post on (Blonde Poker) and actually has a percentage of me in an ongoing MTT stake that I'm running. He's a nice chap, a great player and it's awesome to see him get such a huge result. I actually watched much of the Final Table on PokerStars.tv and what a hand to turn it around heads up. Rupert and his opponent Max Heinzelmann inevitably got the chips in on the turn in a sick hand, with Rupert's 66 vs Max's nuticious T8 on a 679A board (with 2 possible flush draws), and Rupert binked the 10-outer. At the time this looked like the title-winning hand, as the graphics showed they were roughly even in chips at this point, but it turned out Max had a 2:1 chip lead at the start of the hand, so there was still a long way to go! Fortunately he made a couple of great calls and ended getting the chips in good with A5 vs Q5 and held. Wiiiiii. I've listed his blog for quite a while, and if you're interested in checking that out, click here, I'm sure there will be a rather epic post on his win forthcoming. 5 Comments to "April review, $100k & EPT San Remo"
im so happy that i found your blog. which forum do u post in? DM - I post on Blonde Poker as "MC"
Enjoy your blog and would appreciate a return blogroll link, no worries if not though, I'll keep yours anyway.